In the article below, our BOS just gave the Home Builders 3-4.5 million each year in extra profit by reducing the cash proffers by 50%. This is spent money that we, the taxpayers, will have to make up each year........The HBs did pay for the beer at Delegate Robinson's fundraiser..
Now our big govt BOS is going to buy a 5.5 million sports park to go along with their $1 billion Bikeways. The BOS does not have any money .... to spend $1 they have to take, by force, $1.50 from us. A must read for all-esp Christians! Let's make this go viral! As you can tell from my greeting, I am writing primarily to you, the American church. I am doing so personally, not representing Dutch Sheets Ministries. Though this is longer than the blogs I normally send, please read it as an urgent, heartfelt appeal. The sense of urgency I feel is hard to put in words. I have prayed and wept much over the condition of our nation, and continue to be deeply burdened. We are so close to the precipice of a complete self-destruction—a devastation of such magnitude that it would take decades to recover. Some believe a complete recovery would never be possible. The America we have known and loved is being systematically dismantled and reshaped. Voting is a precious right and a serious responsibility; I realize it is also a very personal and private one. We do it by secret ballot in America for a reason. I don't want to be another voice of manipulation—there are so many in presidential election campaigns—therefore, it is with the utmost caution and conviction that I do this. I also want to state upfront that I am neither a registered Republican nor Democrat. Years ago, I concluded that if my "calls to prayer" were to be trusted by believers across the board, I would have to issue them as an independent voter. With this in mind, I relinquished my party affiliation, along with the rights to vote in primaries, help shape party platforms, possibly become a delegate, etc. and became an Independent. Since then, like many of you I have become fed-up with both parties—disillusioned with the Republicans, offended and appalled by the Democrats. I say this to assure you that I am not making this appeal in order to stump for "my party's candidate." Finally, I want to also preface my appeal by saying I have not been a huge Trump fan. Had I been allowed to vote in the primaries, he would not have been my first choice. His seeming arrogance, insults, history of philandering, personal ambition, etc. were very disconcerting to me. I kept an open mind, however, knowing God uses imperfect people and that He is very merciful—I don't condone sin, but neither do I cast the first stone—and knowing that people do, indeed, change. I was also challenged to remain open-minded about Trump by the fact that several spiritual leaders I trusted were convinced God wanted to use him to overthrow an ineffective and corrupt system. Over time, I came to agree with them. However, for me, this election is not nearly as much about who I am for, as it is who and what I am against; and frankly, even with my initial concerns, the decision has never been easier. One of the most devastating occurrences in America in our lifetimes, ranking up with The Supreme Court's decisions of Roe vs. Wade and Engel vs. Vitale (the removal of prayer from schools), was the election of Barack Obama. I gave a strong warning about what would happen to our nation if he was elected. Sadly, it has all come to pass: a continued liberalization and empowerment of the judicial system in America; a weakened economy (our national debt has doubled in 7 years to $19 TRILLION! ); further moral deterioration, along with a rebellion to and mockery of God (does anyone remember the White House lit up in the colors of the LGBT movement after marriage was re-defined by the Supreme Court? If that wasn't an "in your face" to God and those of us who "cling to their God, guns and religion" by the man who mockingly said it, I don't know what could ever be! ); increased violence; a weakened position in the world, along with a weakened military; the advance of radical Islamist terrorism; a setback in race relations; and more. I rejoice that our nation has been able to elect our first black president. I am deeply saddened, however, that it was Barack Obama. The damage has been so great that America is now one president away from a complete transformation to secularism, a loss of our Judeo-Christian foundation, the loss of our position as the stabilizing force for good in the earth, and the leading voice of the gospel to all the world. If elected, Hillary Clinton will be the president who finishes the job. She stands almost entirely against everything we, the church, are for, and for everything we are against. Hillary is pro-abortion, including partial-birth abortion, the most insidious evil of the last century; will raise taxes while continuing out-of-control spending; will further weaken our military; is for completely open borders; is pro-gay marriage; supports Obamacare; has no respect for our Judeo-Christian heritage; sells influence; and is a proven liar. Do not be fooled—she will completely finish what Obama started. The notion peddled by some "Never Trump" Republicans that they can keep Hillary from accomplishing what she wants for 4 years, then replace her with someone they prefer, is laughable. The fact that they should know this, and don't, is truly scary. Even more frightening is...perhaps they do. The Republican Congress has done nothing to stop Obama; why should we believe they will do so with Hillary? When they threaten to curb Obama with "the power of the purse," he simply calls their bluff and either bullies them into giving him what he wants, or simply does as he pleases through unconstitutional executive orders. A Republican controlled Congress has done nothing to defund Obamacare, slow down the TRILLIONS of dollars of debt he has accrued, prevent his treasonous acts with Iran, defund Planned Parenthood and their selling of babies' body parts (can you even believe such a thing even exists, and that the Obama's and Hillary condone it?! ), or stop any number of other inappropriate actions and wasteful expenditures. Much of Washington, DC is an out-of-control cancer that must be cut out. To be sure, there are Republican leaders who desperately want to change things but the entrenched, lobbyist-owned, career politicians–many of them liberals in conservative clothing–have neither the will, backbone, and perhaps not the intellect needed to change it. Radical surgery is necessary. Again, it is laughable to think that the leadership of this weak and diluted Republican Congress would be able or willing to stop the agenda of the libs once they enjoy an even greater momentum from another White House win. Someone please tell me why we should believe that. If the Republican Party has not sold us out, why did they spend $18.2 million on Bush's election in 2004, $53.5 million for McCain in 2008, $42.4 million for Romney in 2012, and $0 on ads to elect Trump?! They have sold us out. It is also ridiculous, and perhaps insincere, for the "Never Trump" Republican leaders to suggest "we would only need to reverse 4-8 years of damage if Hillary is elected, which in the long run isn't much." Again, these leaders are either lying or horribly deceived. The damage presently occurring to our nation is—in the sense of time—exponential. Every year of damage means closer to 10 years in it's longevity. How long will it take America to reverse another $4-8 trillion of increased debt? Decades! How long will it take us to recover from the decimating of our military? Decades! How long will it take to recover from 2–5 Clinton lifetime appointees to the Supreme Court? Decades! If she appoints five, which is feasible, she will have single-handedly appointed over half of the Supreme Court, and will have given the liberal, non-constitutionalists a 30-40 year, 7–2 majority advantage! (There is one vacancy now, and of the other 8 Justices, the three oldest are 77, 79 and 83; two more are in their late 60's.) Then there are the several hundred lifetime Federal Judges she would appoint. Obama has already appointed nearly half of our Federal Judges—all liberals—and Hillary would appoint the other half. This entire scenario is unthinkable! If all this occurs, these overreaching, legislating ideologues will finish the job of decimating everything you and I stand for. America as we have known it may then be gone forever. We have less than three weeks to stop this. Do not listen to the "only four years" crowd! I also want to make an appeal to those who say their conscience won't allow them to vote for either Trump or Clinton, so they simply won't vote at all. I sincerely respect your convictions, but in this election, that argument fails the logic test (as does voting for someone who cannot possibly win). Trump's potential negative developments do not come close to the magnitude of those Hillary would produce. We simply cannot—regardless of our concerns regarding Trump—allow all the above-mentioned consequences to happen. I respectfully appeal to you to turn your "conscience" and "principles" toward the unborn, your children, grandchildren, and the destiny of this nation. Please! We have already been down this "not voting" path once before when millions of evangelicals refused to vote for Romney because he was a Mormon. As disgusted as I am with Romney's current choice of Hillary over Trump, how much better off would we have been with him, rather than 4 more years of Obama? To see how Trump would actually lead, I would challenge you to look at those with whom he has surrounded himself: Pence; Carson; Huckabee; Giuliani; Christie; Gingrich; Palin; trusted generals; law enforcement officials; border patrol officials; evangelical leaders of all races; and otherwise, ethical, conservative leaders. What does this tell us? It is probably the greatest indicator of who Trump now is, clearly making the case that he has changed his moral ways over the past 10 years, as he claims. I personally believe he has changed. I also believe God has gripped his heart for the nation, and is in the process of further transforming Mr. Trump. God has certainly allowed him to be humbled. Of course, the statements made by Trump on the video released from 2005 were despicable. However, if we reject him because of the sins of his past, we would also have to reject Abraham, King David, Rahab, "the woman at the well", Mary Magdeline—all adulterers in their unrighteous past. And don't forget murderers like the Apostle Paul. A lot of formerly despicable people will be in heaven! And a lot of them, by the way, became great leaders and champions for God. Some changed the world. These associations also tell us that Trump's stated conservative bent is genuine, and they state that he is wise enough to know what he doesn't know! I believe Trump is showing us that he will function, if elected president, as any wise businessperson does: find qualified people who know how to get the job done, as in the above examples, and empower them to do it. I like those whom he is signaling to us would be those leaders. They are proven, trustworthy and honorable. If you cannot vote for Trump, vote for them. Hillary, on the other hand, would give us 4–8 more years of polytheists, liberal progressives, media elites, police-haters, global statists, financially irresponsible leaders and a weak military. Vote against the foolish, selfish, shortsighted, establishment Republicans fighting to maintain their power. Vote against an unelected, unaccountable, overreaching, out of control Judiciary that believes it has the right to reshape America. Vote against a weakened military. Vote against a loss of national sovereignty and a one-world government. Vote against policies that enable radical Islamist terrorism. Vote against the removing of our 2nd Amendment rights. Vote against abortion-on-demand, partial-birth abortion, and Planned Parenthood with its selling of babies' body parts. Vote against liberalism and progressivism. Vote against revising our history and the loss of our Judeo-Christian heritage. Vote against the politicization and exploitation of racism, and the polarizing of America. Vote against the slandering and weakening of law-enforcement. Pastors, if you've ever made a stand, make one now—it may be your last chance. Tell your people the truth…clearly. Pray and fast! Turn your services into prayer meetings. To all believers, if you agree with what I have written, forward it to all of your friends and family members. Most of them hear only from a hypocritical, lying media, which is now the propaganda arm of the liberal agenda. Speak up. Appeal to them to read this and think about it. Vote for a future, one that includes what you love and believe in. Trump has flaws, but Hillary will be fatal. Copyright © 2016 Dutch Sheets Ministries, All rights reserved. ELECTION DAY, November 8, 2016 IS ALMOST HERE! * Do You Want a Meals Tax? * CHAIRMAN'S REPORT - YARD SIGNS & GOTV - Candidate Yard Signs are available along with Anti-Fairfax County Meals Tax signs! How can you get them? Please contact your local GOP committee today for signs, Get Out The Vote (GOTV) activities, sample ballots and more. For a big list of links, please go to www.NorthernVirginiaGOP.com. If the link to your city or county GOP committee is not listed there, please click on the Republican Party of Virginia link or call them at (804) 780-0111. Also, if you are not sure where your polling place is, we have a "WHERE TO VOTE!" link at www.NorthernVirginiaGOP.com. If you are interested in campaign and other events, we have some listed below in the calendar and please check our events list at www.NorthernVirginiaGOP.com. Please consider forwarding this important information to interested friends and remind them to VOTE REPUBLICAN! * DO YOU WANT A MEALS TAX? - The 2016 general election ballot in Fairfax County includes a proposal that could result in a 4% tax on top of the regular 6% sales tax on prepared food and beverages. That is a total tax of TEN PERCENT. If you want to help send the word to our elected officials that TAXES ARE TOO HIGH, please go to www.NorthernVirginiaGOP.com where we will have information on the Anti-Meals Tax effort posted through Election Day, November 8, 2016. Also, please tell your friends! 10/29 - Second Amendment Forum & Book Signing w/David Keene, Author, Shall Not be Infringed: The New Assaults on Your Second Amendment - 11 AM-1 PM, NOVA Armory, 2300 N. Pershing Drive, #2b, Arlington. Call: (703) 566-2814. 10/29 - Asian-Americans for Trump Rally - 2-4 PM, Pender Professional Center, 3901 Fair Ridge Drive, Fairfax. FREE, light refreshments will be served. Call: (703) 919-4370. 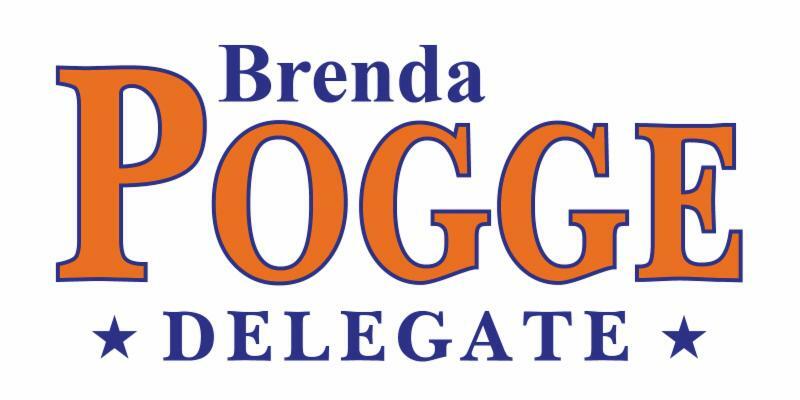 11/8 - Election Night Parties - 7 PM, many are being planned, please check www.NorthernVirginiaGOP.com for updates. 11/12 - Mason Magisterial District (Fairfax County) GOP Committee Breakfast - 8:30-9:30 AM, Magill's Famous Pizza & Buffet, 7201 Little River Turnpike, Annandale. $10. Call: (703) 766-4467. 11/17 - Fairfax City GOP Committee Meeting - The Old Firestation #3, 3988 University Drive, Fairfax. 12/9-12/10 - 33rd Annual Republican Party of Virginia "Donald W. Huffman Advance" - Richmond. Call: (804) 780-0111. 12/10 - Mason Magisterial District (Fairfax County) GOP Committee Breakfast - 8:30-9:30 AM, Magill's Famous Pizza & Buffet, 7201 Little River Turnpike, Annandale. $10. Call: (703) 766-4467. 12/15 - Fairfax City GOP Committee Meeting - The Old Firestation #3, 3988 University Drive, Fairfax. 6/9-6/11 - Celebrate Fairfax - Fairfax County Government Center, 12000 Government Center Parkway, Fairfax. Volunteers needed at the Fairfax County GOP booth. Call: (703) 766-4GOP. 7/11-7/15 - Fauquier County Fair - Fauquier County Fairgrounds, 6209 Old Auburn Road, Warrenton. Volunteers needed at the GOP booth. Call: (540) 729-0265. 7/24-7/29 - Loudoun County Fair - 17758 Dry Mill Road, Leesburg. Volunteers needed for the Loudoun County GOP. Call: (703) 627-5272. 8/11-8/19 - Prince William County Fair - Manassas. Volunteers needed for the Prince William County GOP. Call: (703) 680-7388. 9/5 - Arlington Civic Federation Candidates Night Debate - Virginia Hospital Center, 1701 N. George Mason Drive, Arlington. Call: (703) 685-2488. 9/9-9/10 - Burke Centre Festival - Burke Centre Conservancy Festival Grounds, 6060 Burke Centre Parkway. Volunteers needed at the GOP booth. Call: (703) 766-4GOP. 9/TBA - 21st Annual NOVA GOP PAC Monday Night Football Fundraiser - Call: (703) 502-0161. 9/16 - Haymarket Day - Volunteers needed for the Prince William County GOP. Call: (703) 680-7388. FOIA effort update and good news! Thanks to our Virginian support partners, I submitted the FOIA on Monday the 17th and received a prompt response that none of the information requested is exempt from disclosure; therefore full reports and contracts will be collected and provide to us. Due to the large number of records requested, an additional seven working days is needed. The documents are promised to us on or before November 2nd. We are documenting the progress and hope to provide a detailed step by step to our readers should anyone desire to do their own FOIA. This is our second FOIA on the issue of Refugee Resettlement but my first one. Paula did the first one. Most of you are probably focusing your time and resources on the upcoming election, but for those who have any money to spare, can you help us hit our goal this month? We are short and to process the documents from the FOIA, we will need your help. 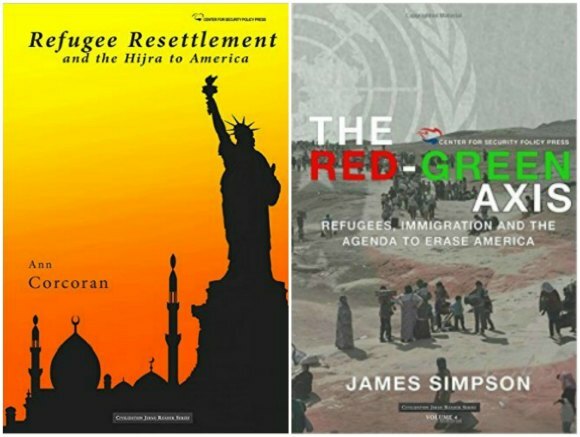 Contribute $75.00 and more, and we will mail to you two free books that will jump-start your education on this important issue. Please support our efforts so we can move forward. Thank you for anything you can give today and call me anytime, would love to hear from you. Editor: I'm really proud to be represented in the U.S. House by the first woman elected to the 10th District, Barbara Comstock. She has a strong record of supporting women in all aspects of business, health and education as well as the mentorship of middle and high schoolers. This is why I was truly disgusted to see the misleading commercial her opponent, LuAnn Bennett, put on television implying that Rep. Comstock has worked against women's interests on the issue of equal pay. The fact is that Barbara Comstock has championed the cause for equal opportunities for women throughout her entire career. Just this year, she was awarded the 2016 Leadership Award by The Women's Center, a non-profit organization in Vienna providing financial, legal, career and mental health counseling for women. In 2013 as a State Delegate, she established a Young Leadership Program which has provided mentorship to hundreds of young women by introducing them to inspiring women in business and science and encouraging them to pursue careers in these fields. She has continued to host this program across our District while in Congress. Barbara has no wage gap in her office and actually pays women, on average, more than men, and she has women in charge of her office, while LuAnn just pays women 85 cents on the dollar and has men in charge of her campaign. Barbara's record is part of a long record of supporting working women. LuAnn Bennett doesn't appear to be aware of what goes on in Virginia's 10th District. We, the women who have put down roots here, support Barbara Comstock's work in Congress. When we see her opponent's misleading ads, we know better. Lu Ann Bennett should know better, too. Subscribers to our newsletter will receive the video series as they come out. Sending this first one as a Special Alert. Please forward to EVERYONE you know! 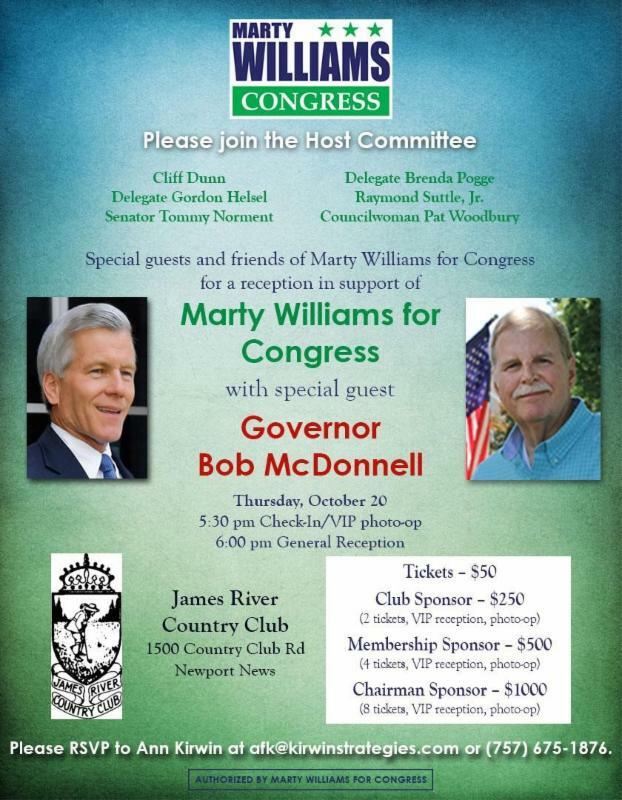 Please join me in supporting my friend, Marty Williams* for Congress! Marty is chairman of the planning commission in Chesapeake and a 25 year veteran of the police force. He will make an outstanding representative for Virginia's 3rd Congressional District. Sorry, no corporate contributions. If you are unable to attend, please consider a donation online at www.MartyWilliamsCongress.com. Contributions to Marty Williams For Congress are not tax deductible for federal income tax purposes. Contributions are subject to the limitations and prohibitions of federal law. An individual may contribute a maximum amount of $2,700, and federal multi-candidate PACs may contribute a maximum amount of $5,000. Contributions from corporations, labor unions, federal government contractors and foreign nationals are prohibited. Contributions must be made from personal funds. Federal law requires us to use best efforts to obtain and report the name, address, occupation and employer for each individual whose contributions aggregate in excess of $200 in an election cycle.